Compare Fedora's default fonts with Ubuntu's here and here. If you want the smoothness of Ubuntu's LCD subpixel rendering in F11 then this post is for you. This is basically a simple "cheat" version for F11 of Breb's original thread, that thread has links to some excellent resources and info if you want to really understand what's going on. And that's it, reboot, login and you should see much smoother fonts. If not, open System->Preferences->Appearance->Fonts and ensure Subpixel smoothing (LCDs) is selected, and in Details choose 'Slight' Hinting. Last edited by sideways; 2nd July 2009 at 03:36 PM. I made an edit to post #1, since on a new install I found that directfb and xcb-util were not installed. Do not run these scripts more than once (it'll copy over your backup of the fedora libs), and do not run from from graphical mode, do it from init 1 or 3. Although «Beauty is bought by judgement of the eye», I find this sub-pixel font rendering more pleasing to the eye and more readable. Would you mind if I translate your tuto in French and post it on www.fedora-fr.org with reference to the original post ? i too prefer fedora fonts. Sure you can add this info to fedora-fr, I just simplified the tips from brebs and lmo's posts anyway, so all info posted here is free to copy and plagiarise. Beware that the ubuntu libraries linked to will only work on F11, you'd have to find the equivalent versions to match earlier fedoras. Also, you might want to host the ufontsxx.tar.gz somewhere else (eg on a free file host) in case the above download link becomes unavailable. btw, I asked sideways for permission to post this on his behalf, he's gone to live on a mountain remote from modern society and the internet. Last edited by Gödel; 17th July 2009 at 02:33 PM. That's a lot of work for blurry fonts in my opinion. If you just want to enable BCI hinting, all you need to do is 'yum install freetype-freeworld' with the RPMFusion repo installed. I don't like BCI hinting myself. I just enable sub-pixel rendering, set hinting to full, and the subpixel order to VRGB. With these settings my fonts are clear and sharp. Regardless, it's nice of you to take the time to post this for those interested. Last edited by rexbinary; 21st July 2009 at 07:57 AM. EDIT: I seldom post without an edit. You mean ubuntu fonts don't you? No i mean fedora fonts. I really do m8. Well can I ask you not to post your content-free (and uninteresting) personal views in this thread, thanks. Isn't VRGB for lcd panels with vertically arranged elements?! I don't notice any difference in font rendering before and after installing freetype-freeworld, do you (or anyone else) have a comparison screenshot to show the difference? 1 small question. Is this subpixel font rendering meant for laptop lcd screens. 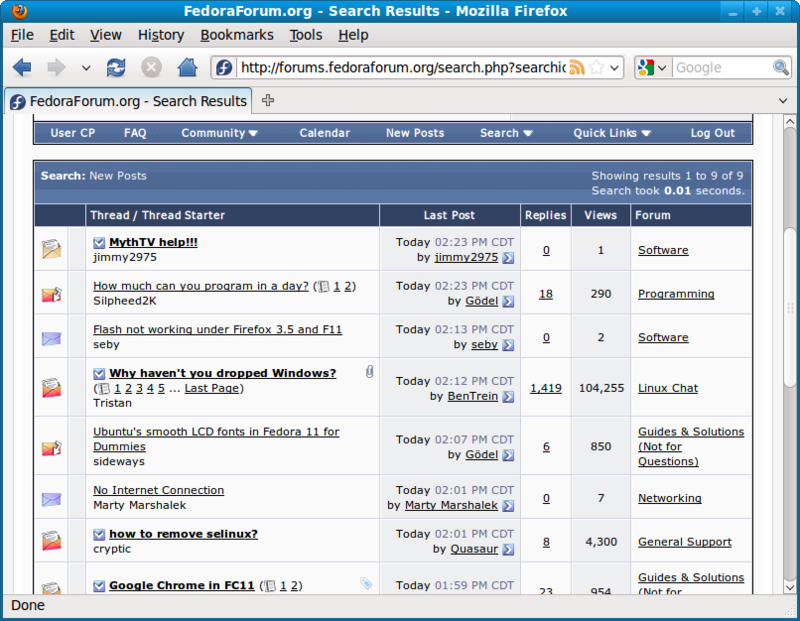 I'm asking because my existing F11 w/o any changes looks better than both the fedora 11 images in http://www.jbg.f2s.com/fonts/big/fontsb.html . The fonts in the image seem colored, whereas my fonts appear normal. Yes, subpixel rendering it's aimed at LCD screens only, but sometimes people like the effect it produces on CRTs. Fonts are a very subjective experience, I'm always surprised that so many people leave ClearType disabled on Windows. I guess the same people wouldn't like the "smoothing" effect explained here. If you ever run an emulator for old game consoles, you'll think the graphics look terrible (blocky) compared to how they looked on a plain old tv in the 80s/90s. The latest Fedora 11 updates will update the cairo rpm to cairo-1.8.8-1.fc11, and this replaces libcairo.so.2.10800.6 with libcairo.so.2.10800.8, so that now needs to be replaced by the ubuntu version. Anyone bother trying these fonts ?